There’s a cyclicality to fundraising. Certain sectors rise quickly and become competitive while others decline. I’ve been wondering about the state of the market. 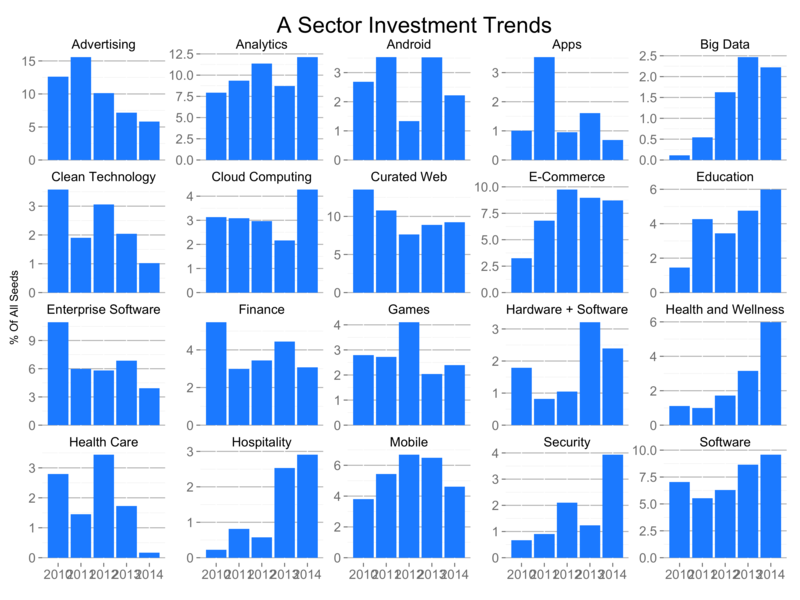 First, which sectors are in vogue now in Seed investing and Series A investing? 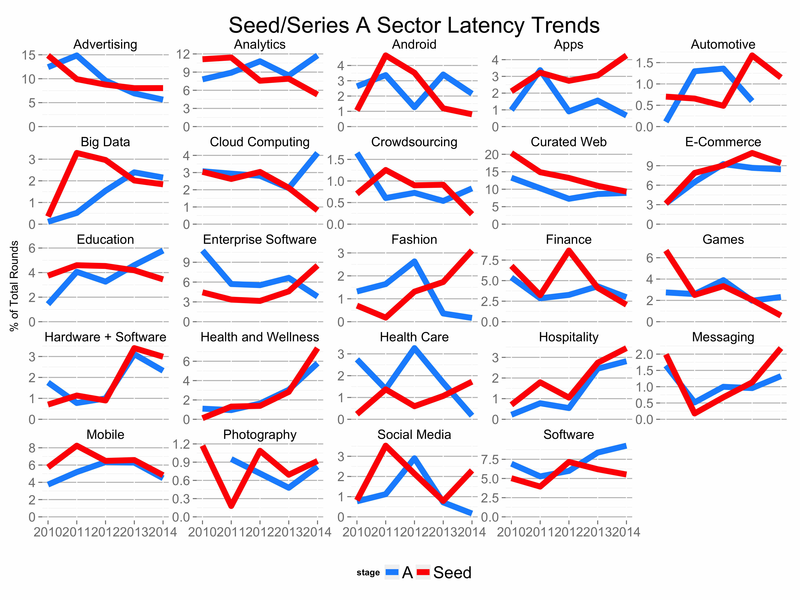 Second, is there a delay between the sectors attracting seed capital and Series A capital? In other words, do seed investors see trends before VCs do? The chart above shows the trends in the seed investment market. This data is Crunchbase data filtered for the largest 20 or so sectors from 2010-2013. Each graph shows the fraction of relevant seeds in a particular segment over time. 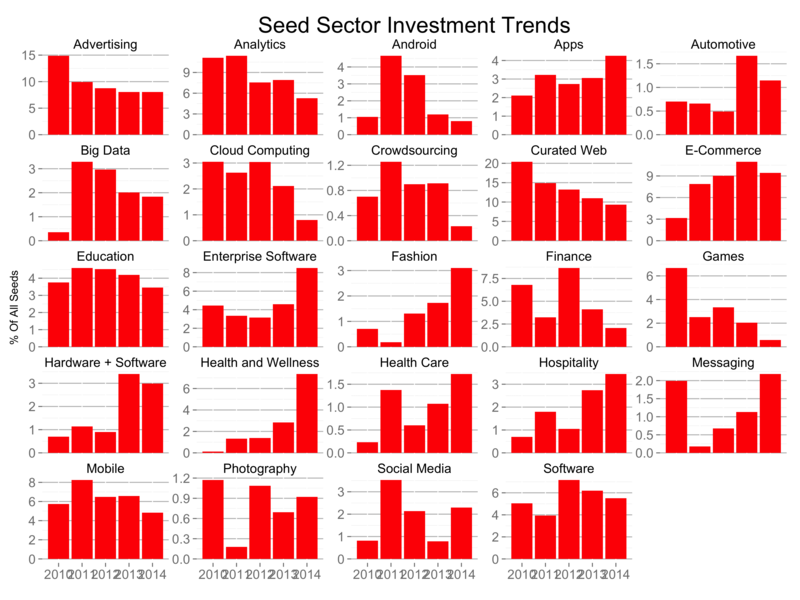 The hottest sectors, those with a sudden increase in seed investment share, include some obvious ones: Hardware + Software, Health and Wellness, and Messaging. The hardware startup movement has been catapulted by the success of crowdfunding, and the quantified self movement has amassed some tremendous momentum as well. More interestingly, though, there are a few surprises: Automotive, ECommerce, and Fashion. The sectors in decline include Advertising, a challenging sector because of the market dominance of Google and Facebook, and Big Data, whose investment share had spiked two years ago creating a swell of competition, and Android. Let’s contrast the seed investment patterns with Series A patterns. I ran the same analysis for the top 20 or sectors in the Series A market. The patterns are similar but not identical. Some winners like Hardware + Software, Health and Wellness, and ECommerce are consistent. But Automotive and Fashion didn’t garner large enough Series A share to surface in this analysis. Series A investors seem to be more bullish on Android companies than seed investors do; perhaps it’s an artifact of latency. The Android startups which raised seeds in 2011 and 2012 raised As in 2013. Series A investors are pursuing Analytics with more gusto than seed investors. Which raises the question, how quickly do Series A investors respond to the trends in the seed market? The chart below overlays the Series A trends across the Seed categories in the top chart of this post. Looking at the data on an annual basis, and though there are exceptions, Series A investors quickly respond to trends in the seed market. In fact, the investment patterns have an annual correlation coefficient of 0.83, indicating a very strong synchronicity. Series A investors follow the patterns set by seed investors, or at the very least, both tend to invest in the same markets at the same time. Getting a bit more granular, we can compare the investment correlation patterns by quarter. The table above shows the data. The coefficient, indicating similar sector investments, is highest during the same quarter and degrades slightly for the next three quarters and then falls suddenly nine months later. When a sector becomes hot in the seed market, it’s hot for another nine months in the Series A market, and then it begins to cool.